For those of you waiting for the next installment of “As the Hive Turns,” grab some popcorn and a drink. It’s a juicy episode. Previously in the beeyard, we were patiently waiting to see if Queen Freeda’s girls would successfully raise a new queen after Freeda herself had been intentionally removed from the hive. It was a long, mysterious wait. [play suspenseful music]. But last week, things got even more mysterious. I was sitting at my friend Mary’s table, positively glowing from the effects of her amazing Nicoise salad, when she discovered a voice mail for me on her cell. It was Dana, gracious owner of the land where my bees humbly reside. “There’s a bee situation,” the message said. No matter what way you slice it, a “bee situation” at nine o’clock at night is never a good thing. [play suspenseful music]. I called him back to learn that the neighbors down the road from my hives had a swarm in their yard. What made it a “situation” was that the swarm was evidentially moving into some cracks in their cabin siding. They were, understandably, upset by this. Swarms in and of themselves can be upsetting. They are big and intense sounding. But what most people don’t realize is that swarms are relatively harmless. The bees in a swarm are not aggressive and they don’t want to sting. In fact, they are so loaded down with honey in the guts, that most of them physically can’t sting. All they want is a new place to set up shop. Ideally just not in between the walls of someone’s cabin. My head was spinning. I didn’t see how it could possibly be my bees. I’d been checking them so thoroughly and regularly. None of the hives were in a position to swarm. Still, it did seem like a reasonable assumption that they were my bees. Either way, the light was fading fast. I called the neighbors to explain that there was not much I could do at the moment. Nor was I available until late the next day. But these details hardly mattered if the swarm was moving into the walls. I’m not a bee whisperer, I confessed. I can’t coax them out with a flute. I sadly concurred when they said they wanted to take care of it with poison. [play sorrowful music]. When I finally did get out to my hives the next evening, I was relieved to see that all three had strong populations. And all three hives had eggs! The presence of eggs suggests the presence of a queen. And if you recall from our last lesson, a swarm typically leaves with the old queen days before the new queen in the hive even hatches, and sometimes weeks before the new queen will start laying. My honeybees have taught me never to guarantee anything, but I was fairly reassured that the “situation” swarm did not originate from one of my hives. I was particularly interested in seeing the new queen in Freeda’s former mystery hive. But of course, because I was really looking, she was nowhere to be found. Still, there were eggs! And small larvae. Surely this means there is a new queen, right? Right. Except for the fact that my bees have taught me never to guarantee anything. Maybe I have a new queen. Maybe I don’t. Maybe it was my swarm after all and those were residual eggs. I buttoned up the hives, not really convinced of anything. But wait. There’s more. [play suspenseful music]. It’s time for the quiz. Did I mention there would be a quiz? [play dreadful music]. Remember last time when I explained that the special royal jelly a larvae gets fed is what enables it to develop into a into a queen bee with fully functioning ovaries? Well guess what? All of the other hundred of thousands of worker girl bees have ovaries too. Most of them just aren’t fully developed. Which means (20 points)? Which means that some workers can lay eggs too. They just aren’t fertilized eggs. Which means? Anybody, anybody? Workers can only lay drone eggs. The problem with this is that drones don’t actually work – they don’t forage, they don’t help keep the hive clean, the don’t tend baby bees. They’re just nice, big thugs, remember? They’re nice though. They don’t even sting. 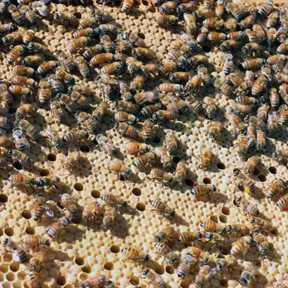 Sometimes when a hive is broodless for several weeks (as a result of there being no queen to lay eggs) a worker can be triggered into laying eggs. It doesn’t matter to them that they can’t lay fertilized worker bee eggs, they just simply sense a lack of eggs in the hive and try and pick up the slack. Yet one more thing I love about honeybees. They don’t slack. Unfortunately, it is very hard to stop laying workers once they start. And what you end up with is a mess. Instead of laying drone eggs off neatly to the sides and edges of the frame, like a queen does, laying workers put their eggs in cells all over the place, all willy-nilly. 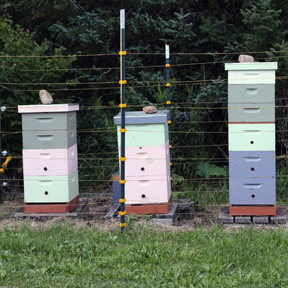 Including up in the honey supers – which is no place for eggs. The mystery hive is currently a royal mess. But here’s the thing about laying workers. There are generally several in a hive. As a result, it is not uncommon to find 2, 3, or 4 eggs in one cell. And because they don’t have the long slender build of a queen it is difficult for them to drop their eggs in the bottom of the cell. Often they land on the side walls instead. So I was perplexed when examining the frames. I didn’t see any double eggs. And they seemed properly laid. So it’s possible the new queen hatched and came back to the hive, but was not successfully mated and is therefore laying mostly unfertilized drone eggs. 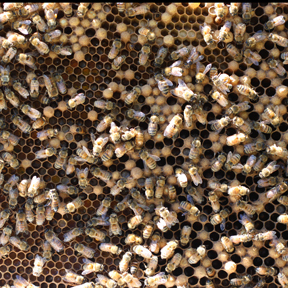 But even well fertilized young queens can be a bit sporadic in their laying patterns. It takes them a while to dial into properly laying a 1000-2000 eggs per day! So maybe the new queen is just working out the kinks. Or maybe a few workers got restless and started to lay all that drone brood, only to have the new mated queen return and take over. And of course it could be that there really is no queen, but highly talented laying workers instead. You should know by now that I can’t guarantee anything. So once again, I found myself pulling a frame of eggs from the real Freeda’s hive and giving it to the mystery hive. This way they will at least have some fertilized eggs to work with if they decide that they do infact need to raise another queen. Which means (another 20 pointer)? That I have another painstakingly long wait ahead. This wait, however, will be spent in a canoe in the Boundary Waters. And that, I’m pleased to say, is the very best sort of wait. I love this!! What a thriller. When you’re back from the BWCA, I look forward to the next installment of As The Hive Turns. Another Hive. The Young and the Queenless. I’ll stop now. I love it! The Young and the Queenless. Ha! It has been a long time since I truly have been captivated by what I am reading and your last entry (which was my first time reading your blog) truly kept me captivated. I love it and thank you so much for sharing! Can’t wait for you to come back from the BWC! Perry Mason type suspense. I await your return! Oh how I can relate to the never-ending saga of a bee hive. I am pulling for the new queen. Hope when you return you will find that most beautiful of sites, a fully loaded brood pattern. Seems serious, but I love the Young and the Queenless and As the Hive turns. Gripping, absolutely gripping; gotta get Perry Mason and Della Street to investigate post haste.